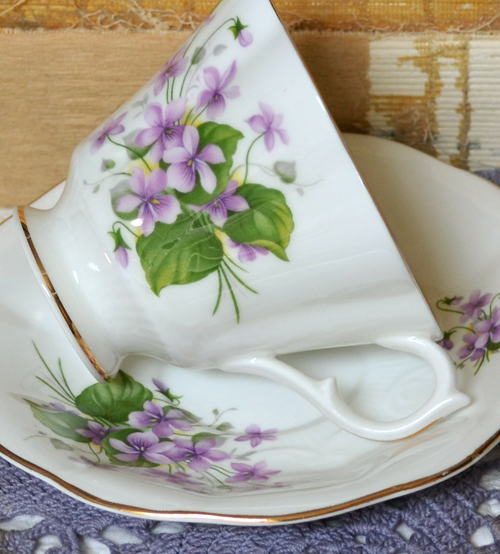 What could be more cheerful than a cup full of violets? ...made of hand painted porcelain? and a frilly romantic a cup. And just in time too...a new storm system is brewing! and that you are enjoying life. 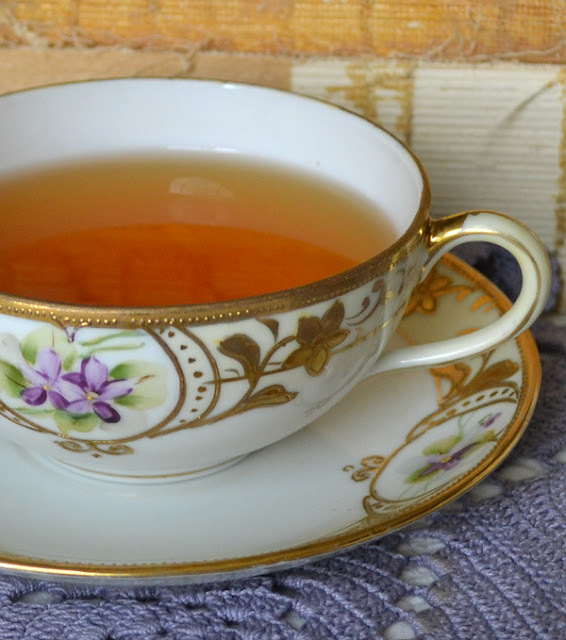 ....to join in, just create a post with your tea cup in it, and come back here to link up that post to Linky Tools below. Martha and I make the rounds each week to everyone's tea post and truly enjoy or visits! and has many gorgeous sets of tea cups to share. My JoyFull July Giveaway ends Wednesday!!! So if you have not yet entered just go Here to see the prizes and to comment! Beautiful teacups! Thanks for hosting! 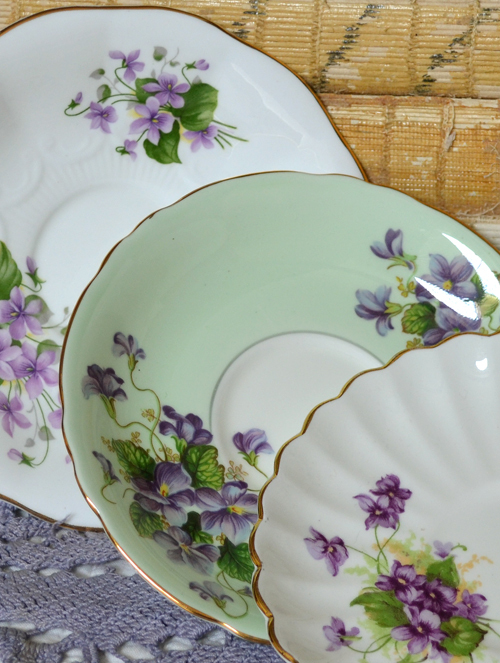 My Grandma's name was Violet and she had a violet patterened china. I still think of her when I see violet china. The pastel green and violet tea cup is delightful! Oh, what a beautiful collection of cheerful violets! I've been away from home for so much of this summer that I've been missing your beautiful posts. I'm hoping to catch up soon! All the violets are pretty and dainty, but that first one, minty green with such rich purple violets is the best! Just love that one! Thanks for sharing it. What gorgeous teacups! Each one is so sweet adorned with dainty violets. I'm sure each one is a pleasure to sip tea from too. I love them all stacked up. Thank you for sharing your pretties and have a fabulous week. 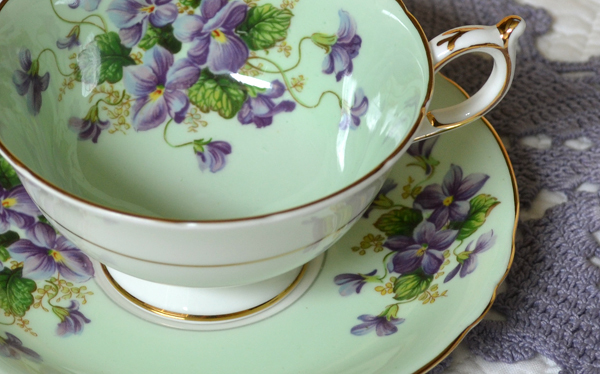 Gorgeous teacups..you mean now I have to look for teacups in violets?! I'm just getting Eng. transfer, lol! Thank you for hosting. What a wonderful collection of violets. I have always loved them. Thanks for hosting and sharing your wonderful collection! Terri, they are so sweet all, but the frilly one filled with the most beautiful violets is my faverite, so beautiful, and lovely, I would feel like Jane Eyre drinking tea of this one ,lol. HaPPY tuesday to you,and thanks for this sweet morning visit. Terri, WOW ... all the teacups are gorgeous with their beautiful violets, but I absolutely loved the first one... the violets on the green. Divine! Happy Tea Day and thanks for hosting! Violets are probably my earliest favorite flower. In the spring my yard is overflowing with them. Love them so much. 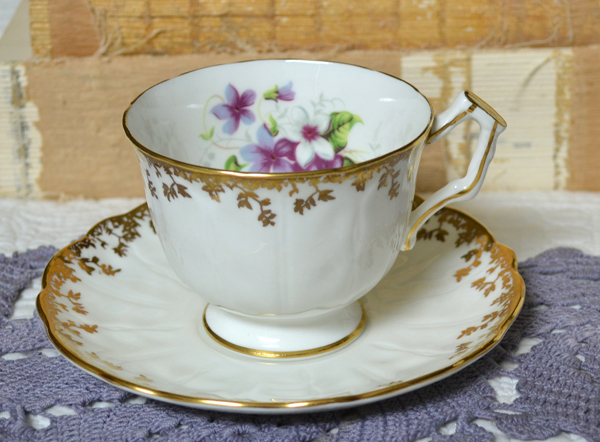 I have several violet teacups of my own. Thanks so much for sharing yours! Your sets are so very gorgeous today! Just puts one in a cheerful mood. I love special handles on the tea cups. The gold trim is always a plus! Glad you are getting some rain. you really have the loveliest tea cups Terri! thank you for your sweet words. I delated the wrong comments as you told me. Here I am again to have tea with you. 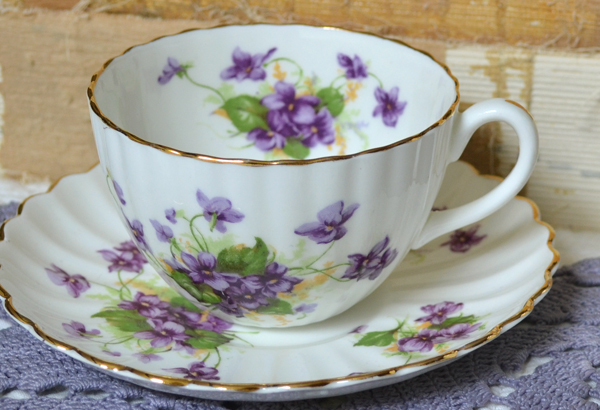 And tea with violets on stunning cups is really lovely! 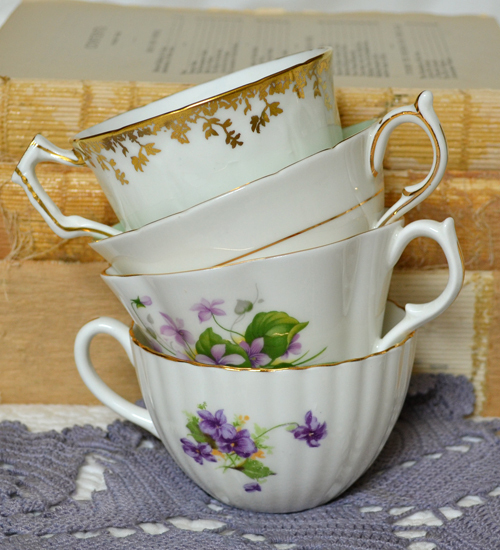 Your violet tea cups are wonderful and I love when you display them stacked. Thank you very much for hosting again! 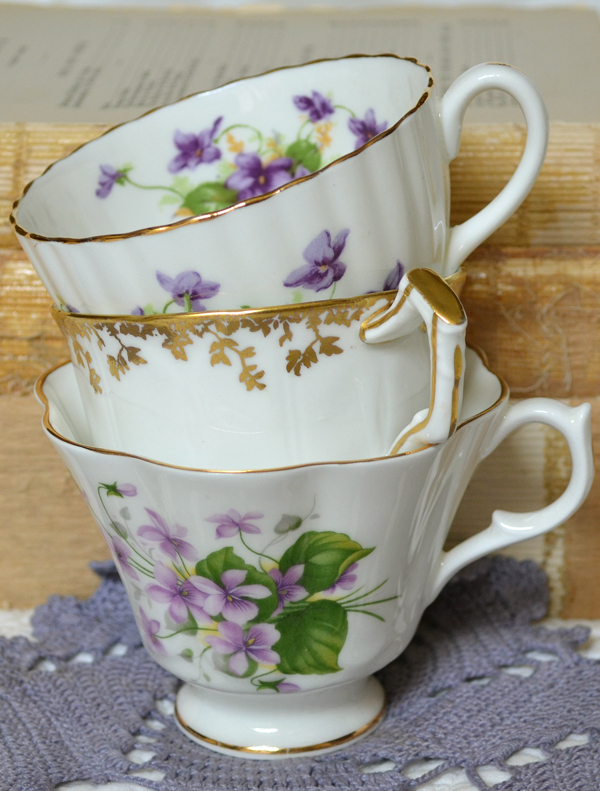 Beautiful violet teacups! I fell in love with the first one and then all the rest! I have a few, but not as pretty as yours! Thank you for hosting your party this week! You always have the most beautiful teacups and I run out of creative ways to say the obvious, exquisite! 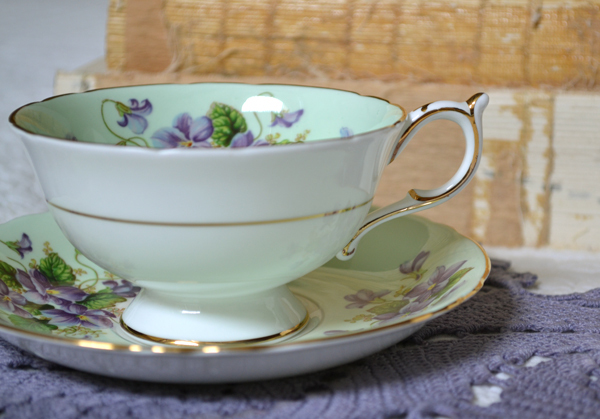 I especially like the first teacup shown.The green sets off the violets so well . 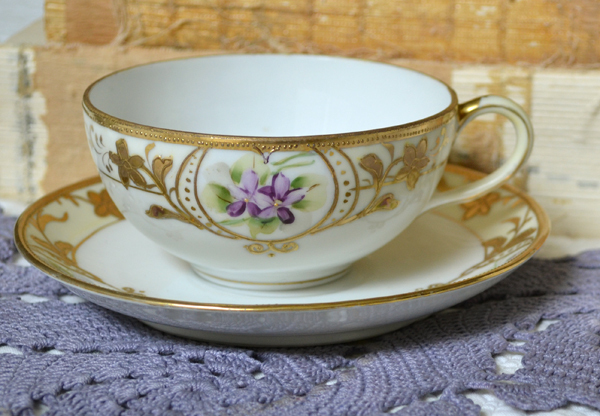 These violet teacups are so pretty! I love how delicate they are. We've had several little rain storms also recently. It is a blessing, after all the dry hot, weather! Tho' we still have some very hot days. 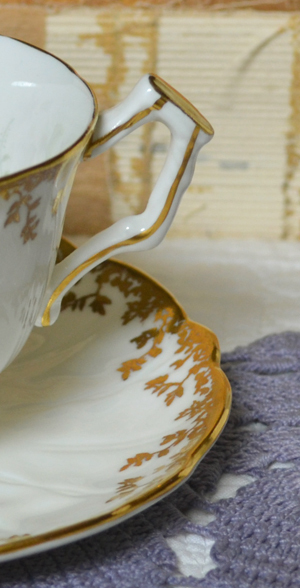 Lovely violet teacups and saucers! I love purple anything!! Thanks for hosting and sharing! These are all so very pretty...but i especially love the first one..and that pale green shade..so enchanting! and violets are so charming! !Wonderful tea time...hugs friend! Artist Share -The delightful Art of Flora!